This week was spent cycling around Hradcany, not for the first time and probably not for the last either. A large large part of this area is within the castle wall, in fact it is the largest castle construction in the world allegedly and dates back to the 9th century so pretty impressive. 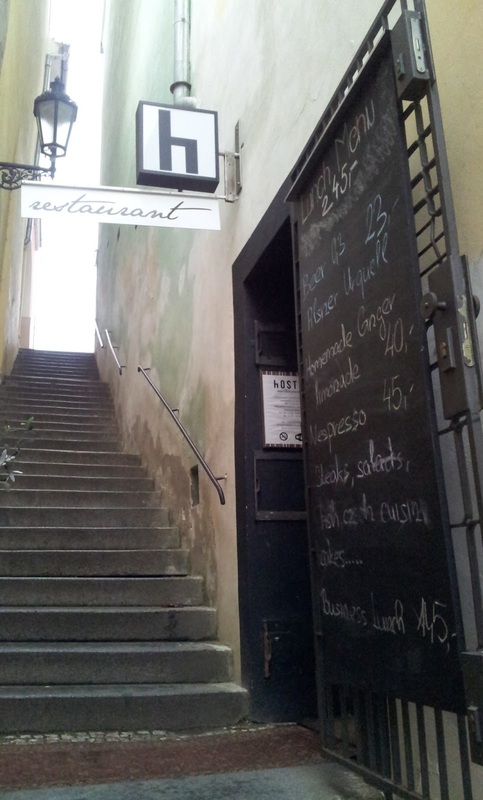 It is probably the most visited area of Prague though there are not so many places to choose from for the blog so for that reason I decided to add a list of great views that can been seen from the four corners of this district. Before I visited Hradcany for this post I was out with one of my good friends Petr for a few Pilsner Urquells (probably the best Pilsners in Prague) at U Jelinku close to Jungmannovo square and he was telling me the story of his Father as a young man and the time that he was arrested crossing the Czech Border, strangely back into Czechoslovakia and how he found out lots of interesting things about him when he was on National Service and working at the National Archives in Prague, so imagine my excitement when I found myself standing outside the national Archive in Hradcany. I asked Petr to write me a few lines because he is a better story teller than I am and also it is his story to tell so I didn't want to do it an injustice, hopefully this article might inspire him to write something for the blog and if he does then I will attach it below. I was invited for the first time to visit the Valasska Pivnice by the manager of the Pivnice Jiri Bednar whose family also run the Minipivovar Bon Zasova in Valasske Mezirici that produce the beer which is sold at the Pivnice. 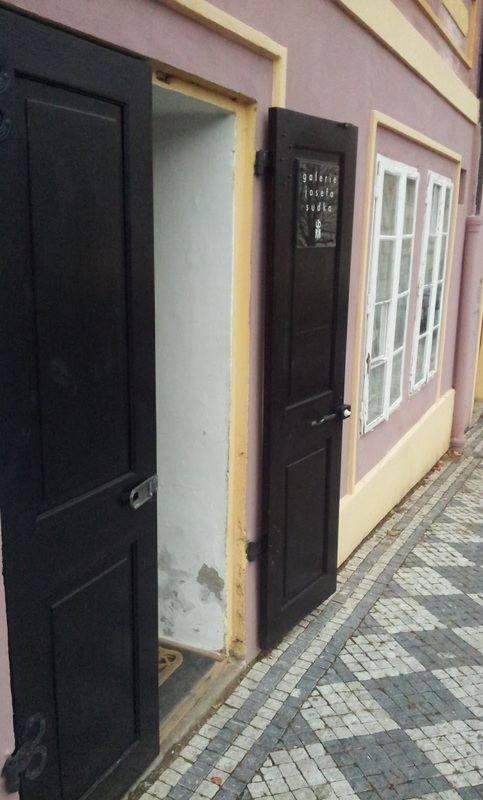 I have passed this place a few times but I initially thought that it was a very small space on the ground level but on entering I found out that the small space is under refurbishment so it is not clear what will become of it and the pivnice is downstairs. If there is one thing that Czechs do well, or maybe I should say Wallachians, and that is beer cellars, as the Family's roots are firmly rooted in the Valassko region which borders the mountainous region around Vsetin. 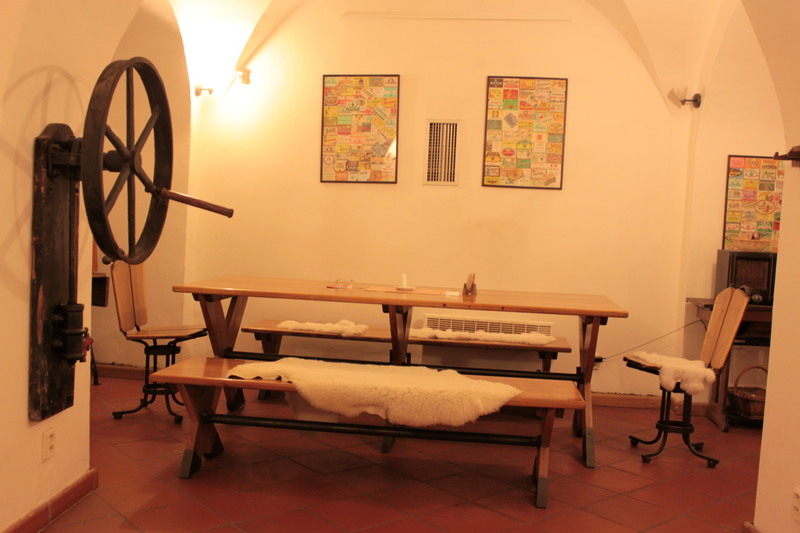 I was invited to visit on a Monday evening and on arrival I was happy to see that the Pivnice was not empty and that there were a few tables seated and enjoying the bright cosy cellar. The majority of the tables were large tables with a bench on either side and a few smaller tables were scattered around in the spaces left. The Manager had written to me, in Czech I have to tell you, and wrote that he would not be able to make our meeting and on arrival I should introduce myself to the waitress who had been informed that I would be visiting, and I hope given instructions that I was a guest of his, not that I minded paying of course. 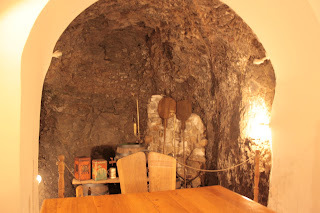 I sat down away from the bar and close to an arch way, which from where I was sitting and the tools on show looked like an old coal mine but later on I was to find out that it was part of an old tunnel stretching from the Monastry above to the castle below. They had 3 beers on offer though when I was there they didn't have any wheat beer available, which considering it was a Monday was not too surprising and if you add to that, the fact that I don't particularly like wheat beer, was not such bad news. I ordered a small light beer, not wanting to be greedy and was pleased with the result, it was served cold and with a smile and had an original taste, slightly sweet. 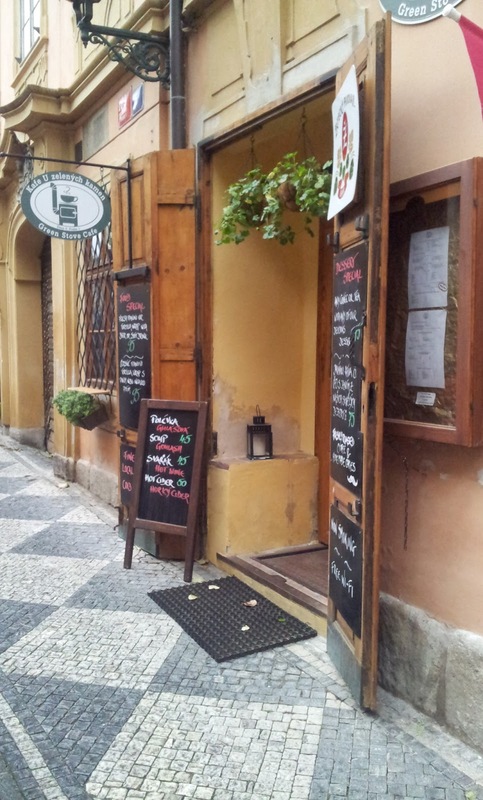 As I was sipping my beer I focussed on the other 2 tables that I could see and they were both Czech and were both served pretty swiftly and both of them had ordered some food off the menu. 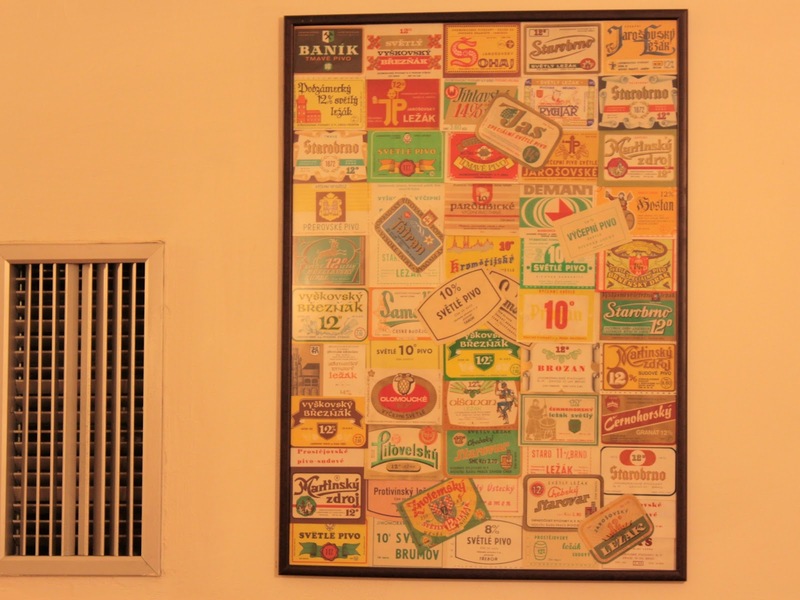 The most popular orders seemed to be the sausage and cabbage soup and the gnocchi. 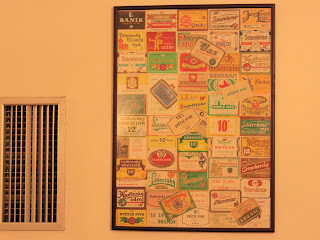 The walls were decorated with tools and implements related to Farming and that is what the region of Valassko is known for apart from its beautiful nature of course and there were also a few frames which had been filled decoratively with Czech beer labels so I had a count of the number of beers that I had tried and not surprisingly I still have a long way to go until I have tried them all but I have managed to get through a fair number of them it has to be said. The waitress came back to me and this time I ordered the dark beer which had a real sweet treacley favour. 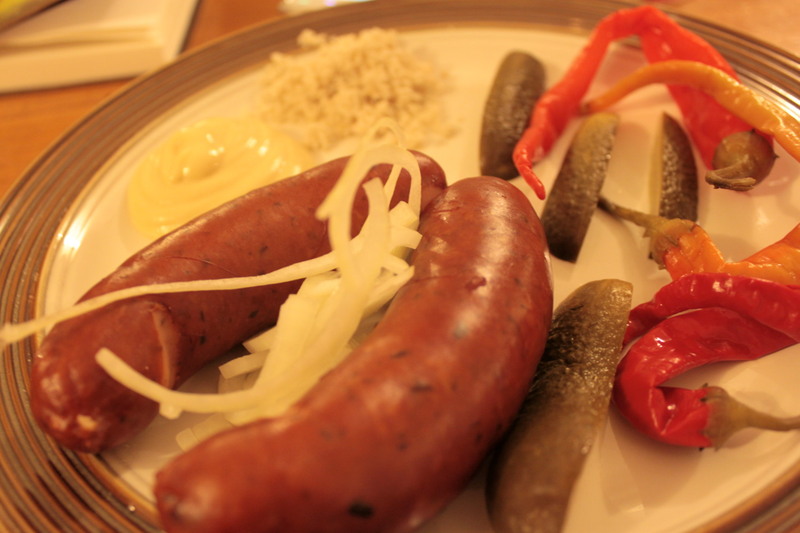 This is the one distinct thing that differs Czech dark beers from others, their sweetness. During my 2nd beer I was greeted by Jiri Bednar, the Manager of the pivnice and as I found out the 10 apartments which are above the bar and he started to speak to me in Czech so suddenly I was a little concerned that we would be left sitting there in an awkward silence but with my maly cesky and his little English, we managed I hope to discuss the bar and their brewery and his thoughts. The first thing that I learnt was that his family and the brewery are from the Valassko region of the Czech Republic and the decor of the pivnice is decorated accordingly, as I mentioned before they are known for their farming especially livestock and on each of the benches/chairs are draped with sheepskin pelts. The food on the menu is from Valassko and though there are some familiar names, they are slightly different, for example there is also a Slovak influence on the food such as halusky and gnocchi for example and an awful lot of hard alcohols such as the one that I ended up trying, which was a beer brandy and although it was clear, it had a rough whisky quality to it. All in all I had a really nice time and although Jiri did recommend that I should try the pork fat with bacon bits, I decided to go for the sausage which was different to the typical Prague sausages, served with the traditional accompaniments of mustard, horseradish, pickled cucumber,pickled chillis and bread, and it was very nice. Throughout the evening music was being played from the sound system at a comfortable level I should also say, and as I am quite a superstitious person so it was nice, when I heard one of my favourite songs being played (Rod Stewart's 'I don't wanna talk about it') I knew right then that it was going to be a great evening. I finished off the evening with a rezane beer and a Beer Brandy and this was my favourite beer of the night. I was also happy that I was able to talk to Jiri and between his English and my Czech I was able to get an idea of the family Bednar and their passion of good traditional food and drink. I was also surprised that the brewery is fairly new, about 10 years old and apart from the 3 beers that they produce, they do bring out specialist beers for celebrations and Christmas. 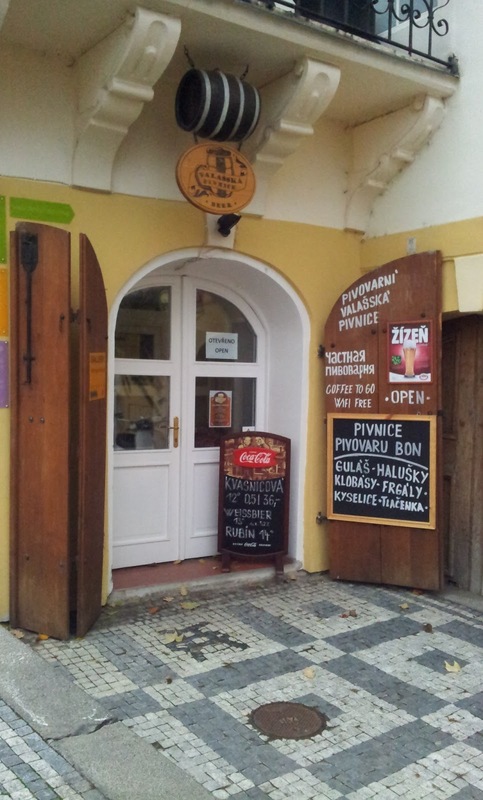 The Pivnice is in the main tourist hub and it was nice to see reasonably priced food and beer. 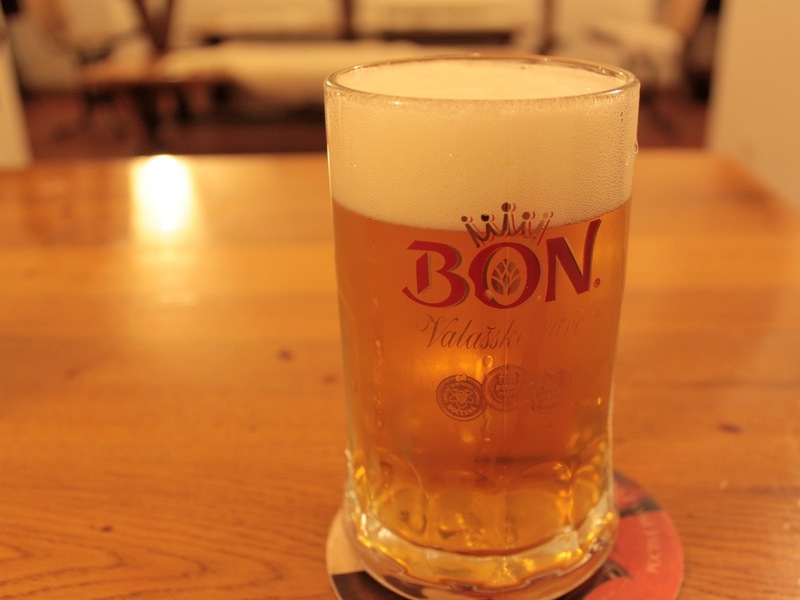 A large beer was only 29czk which was made in their brewery in Valassko and delivered to Prague. I would definetely go there again with friends. It is a great place to go to get your night off to a good start.